PRB Australia has been operating for over 25 years, with founder Peter R Bladwell (hence PRB) still at the helm. Peter built his first Lotus 7 replica in the late 1970s for a friend, and then returned back to his normal job as an electrician. But after a few years he was back building more cars, and since the early 1980s he and his staff have delivered over 300 PRBs and in doing so have gained a reputation as the builder of this country's best clubbies. Over the years growing demand lead to him purchasing a factory unit in Greenacre, Sydney, which he still occupies. Peter has continually developed his cars, using leading-edge materials and techniques to stay ahead of the pack. He was the first to build monocoque cars using honeycomb aluminium sheeting, and the first to utilise inboard F1-style shocks actuated by pushrods. The classic S2, of which just on 100 were made, and which are still in great demand on then secondhand market even if some are over 20 years old. Many S2 are still racing with great success in the PRB Race Series - our picture shows the car originally owned by Paul Arnott, chassis 69. His next creation was the "Composite" model, with the chassis replaced by honeycomb aluminium providing much greater torsional rigidity. These cars were not sold as kits due to the complexity of manufacture, but were sought after with some owners waiting over 2 years for delivery. Whilst Peter planned to keep the last Composite car for himself, the arrival of the new PRB Widebody demo car (more later) resulted in him selling it to clubbie enthusiast Mark Goldsworthy. Our photo shows the composite of Ash Price in West Australia. 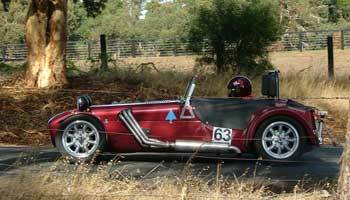 Between 1999 and 2005, Peter distributed the Birkin Clubman from South Africa as the PRB/Birkin S3 - this was offered predominately as a kit, and over 150 cars were sold over the six year period. Our photo is of the S3 built by Warren Bromley, who made a few body changes to differentiate his car. The latest, and current PRB model is the "Widebody", developed in response to a need for more cockpit room required by many potential owners. 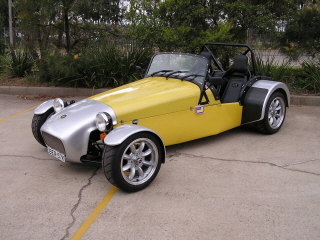 Built entirely at the PRB factory, the Widebody is true to the original Lotus 7 look but is 10cm wider overall in the passenger compartment. The Widebody utilises modern engines, our photo is of Peter's factory demonstrator. Peter has always strongly believed that the real purpose of a clubbie is motorsport, and the factory has always assisted race drivers with the preparation and, if needed, repair of their cars. PRB has also been instrumental in the creation of Race Series for clubbies, including the Clubman Challenge and more recently the PRB One-make Race Series. A new company PRB Motorsport was formed to administer the Race Series, giving PRB owners the opportunity to race against similar cars in a warm, friendly environment.